Zanzibar – a destination that conjures images of exoticism, rustic storied buildings, cobbled streets, spice markets, palm-fringed beaches and picture post card turquoise seas. 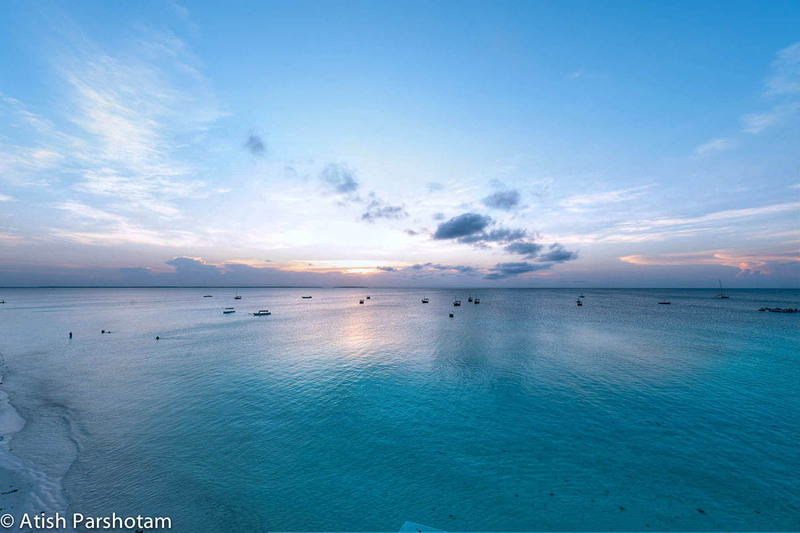 Lying only a short distance off the Tanzania coast, Zanzibar with its strategic location at the crossroads of Africa, the Middle East and Asia, has long been a center connecting East Africa and the outside world. Seemingly at odds with its idyllic geography is its dark history as the Africa Great Lakes region’s main slave-trading port. 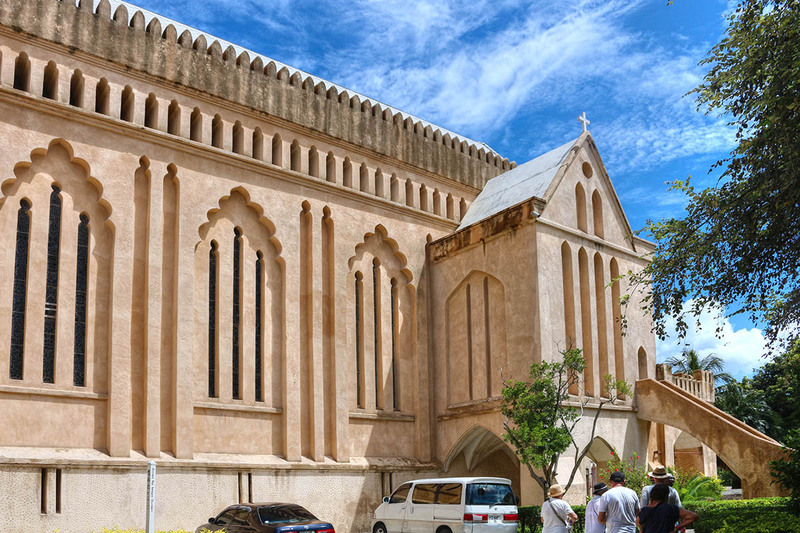 The Zanzibari architecture speaks of many layers of a dark and sinister history – a ghastly reminder that Stone town was host to one of the world’s last open slave markets. A market where the enslaved were confined in dark, airless, underground chambers before being sold to work in the Island’s clove plantations or awaiting their sale and transport to a far distant land. A moving memorial; the Christ Church now stands where the market once was, reminding visitors and locals alike, of the atrocities committed on that very spot centuries before. 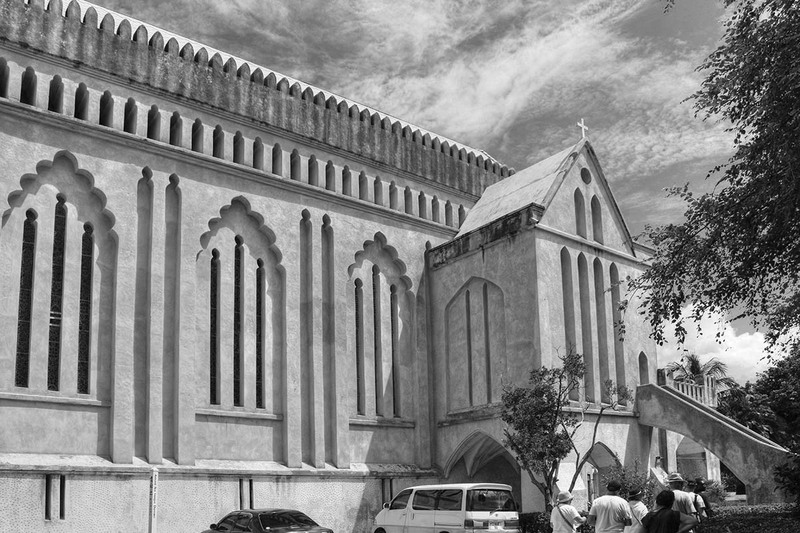 The Christ Church is an Anglican cathedral in Stone Town, Zanzibar. 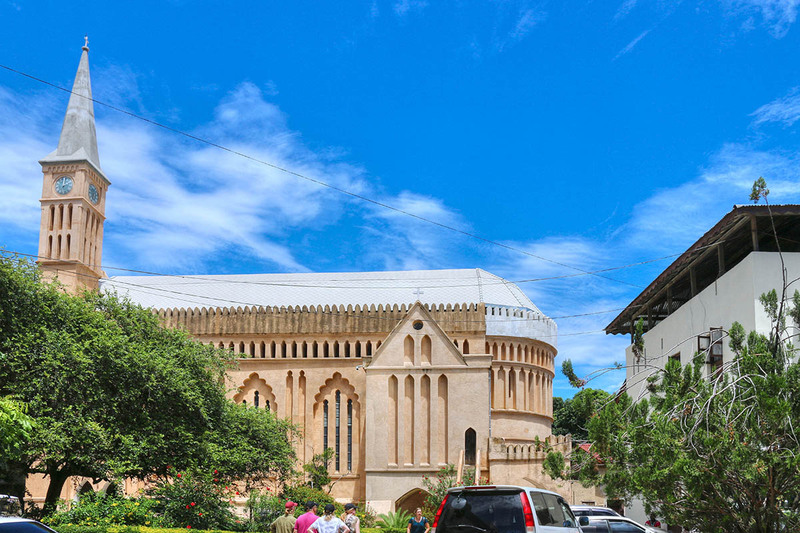 Located in Mkunazini Road, in the center of the old town, the historical landmark is one of the most prominent examples of early Christian architecture in East Africa and is also one of the most distinct buildings in Stone Town. The Cathedral’s altar symbolically stands on the location of the whipping post, obviously as a statement of redemption and restitution. The foundation stone of the church was laid by Edward Steere. 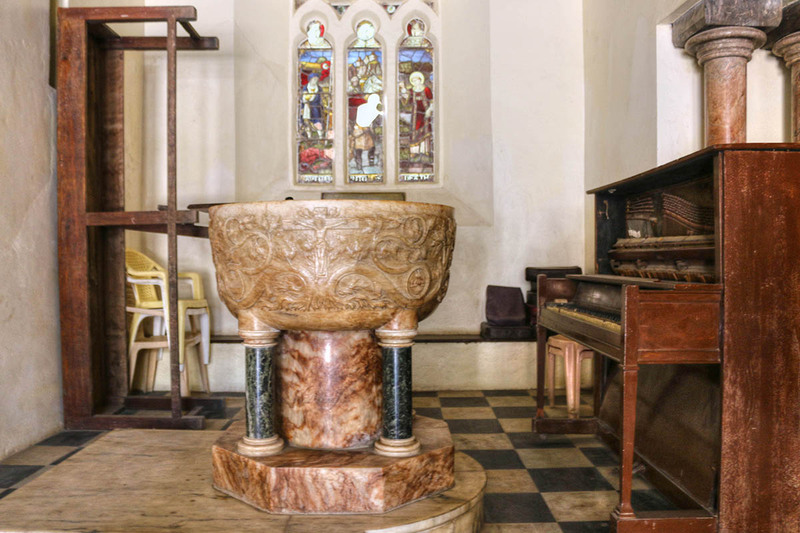 The building of the church was an amateur project he personally supervised as the third UMCA Bishop (Universities’ Mission to Central Africa was a missionary society established by members of the Anglican Church within the universities of Oxford, Cambridge, Durham, and Dublin). Edward Steere did not get to see his project to completion, he died of a heart attack when the cathedral was almost completed. 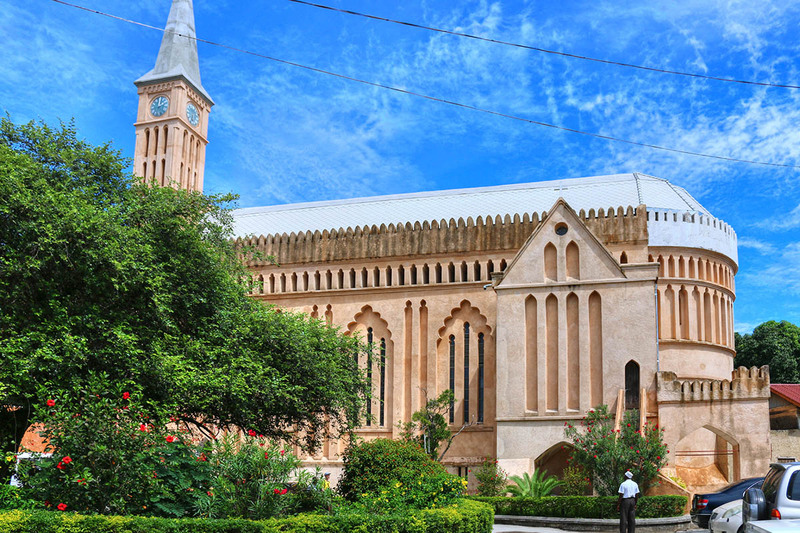 The cathedral’s design is notable for its fusing of stylistic elements of Zanzibar and the Middle East with late Victorian Gothic and arts and crafts decorative motifs creating a typical Zanzibari eclectic style. For only $5 (non-locals) you can access the church and the museum. You can take a tour with or without a guide. First place I visited was the monument to the slaves who had once been sold on the site. The monument was built by the Scandinavian artist Clara Sönäs. 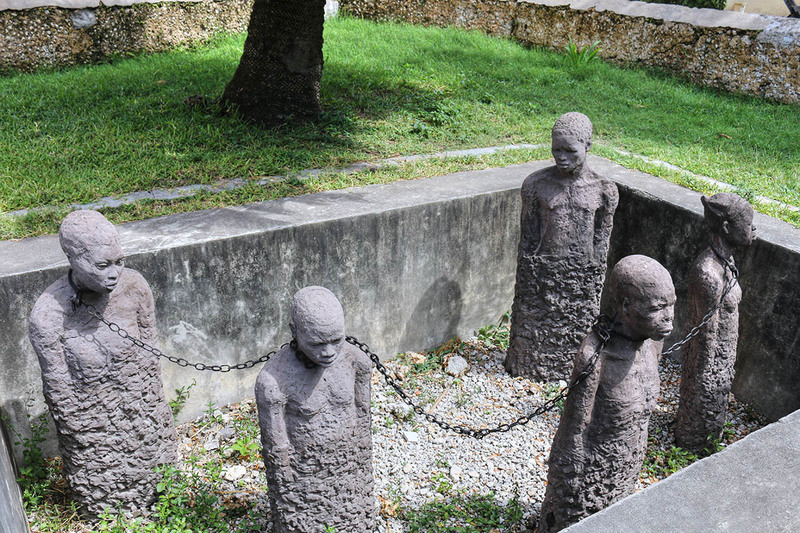 It shows five slave figures, slightly larger than life, chained together in a pit. They are men and women, young and old, with features that show the variety of tribal and ethnic backgrounds. Their expressions are neither of torment, nor resignation. They look numb, worn down, and yet somehow defiant. 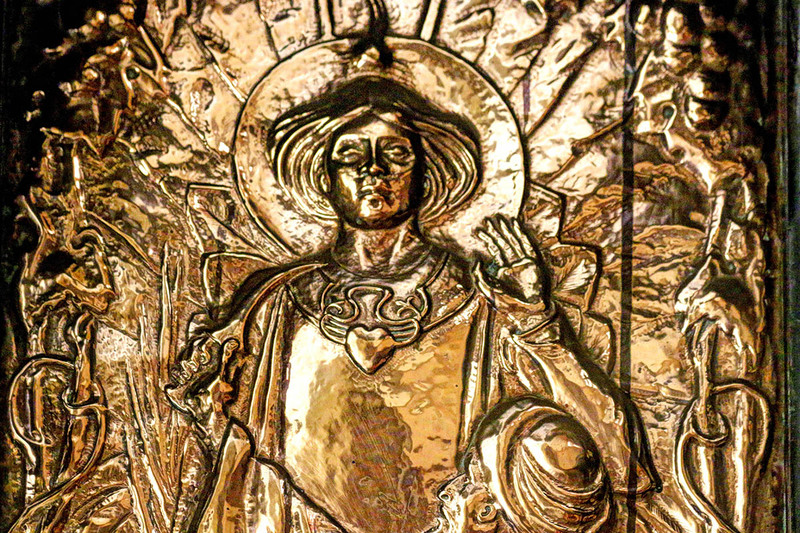 From the monument it is a few steps to the entrance of the church. Once you get into the church you will be rewarded by a view just as beautiful as the outside. 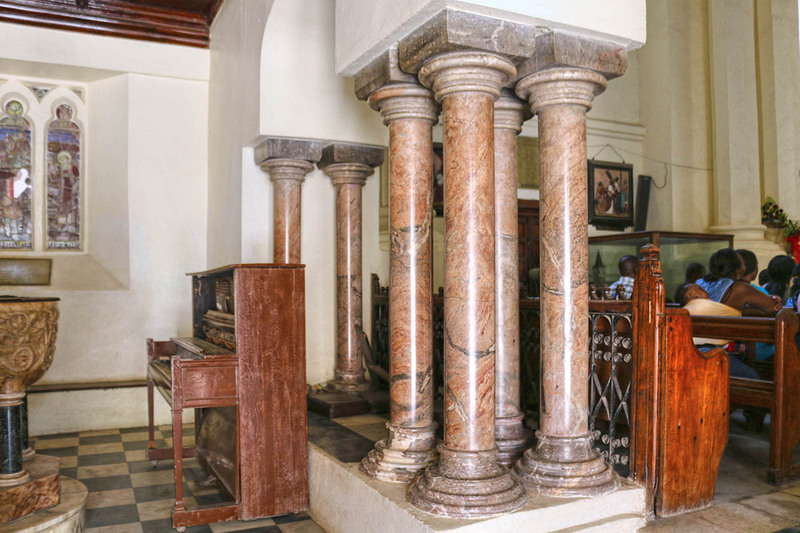 The entrance leads to the back of the church which is adorned by beautiful marble columns. Right next to the marble columns is the baptistery, made of marble as well. The first local Christians were baptized therein. 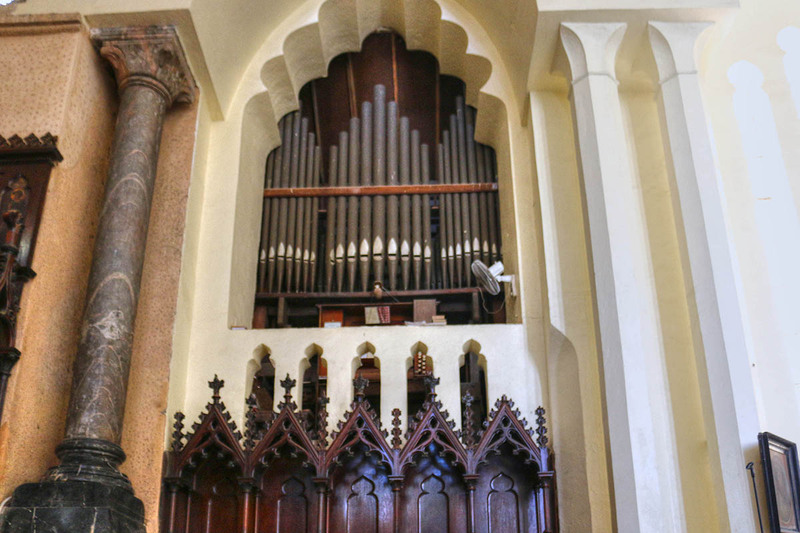 I do recall the guide mentioning something about the organ in the church being one of two of its kind in Africa. I couldn’t find anything to substantiate that claim online so I doubt that he was right. 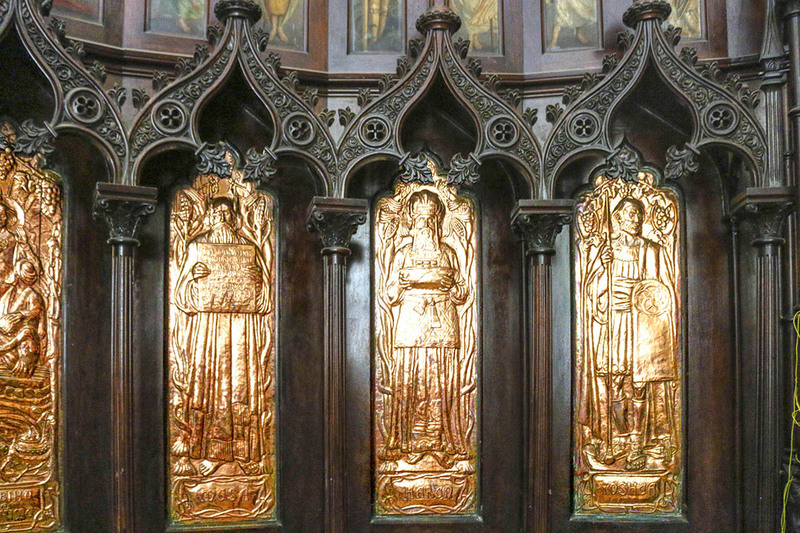 The copper panels behind the altar represent various Old Testament figures. 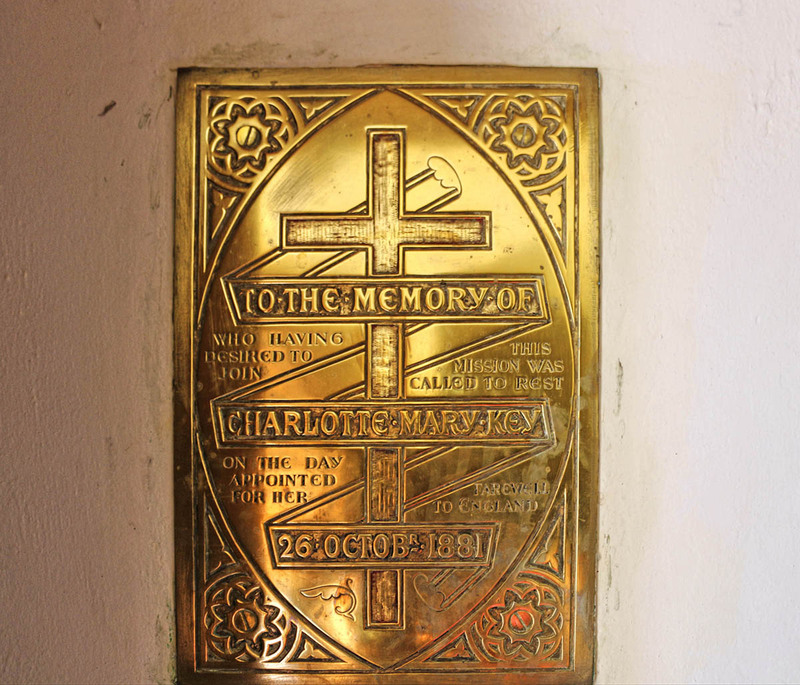 The walls of the church are littered with memorial plaques to honor the missionaries who died while serving in Zanzibar. 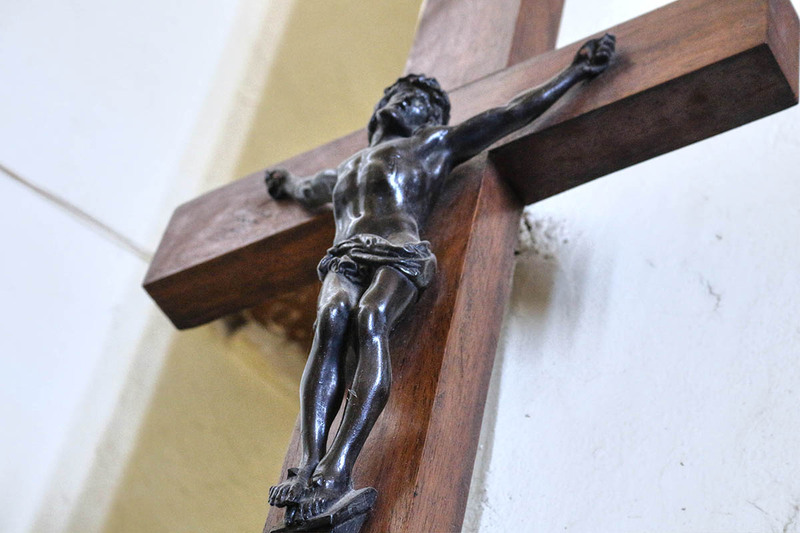 The wooden cross was made from the tree beneath which the famed explorer and anti-slavery crusader Dr. David Livingstone’s heart was buried at Chitamba village Zambia in 1873. 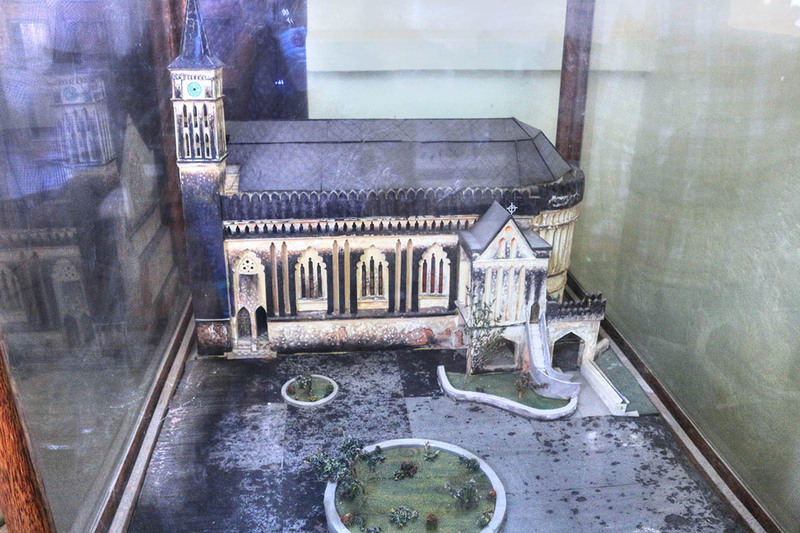 It was presented to the diocese of Zanzibar in 1901. 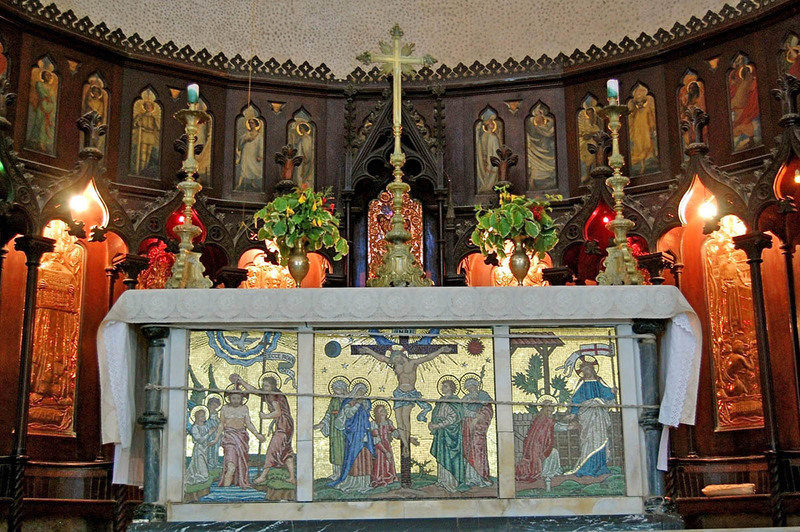 The altar is said to be in the exact place where the main “whipping post” of the market used to be. Edward Steere was buried at the church he helped found. 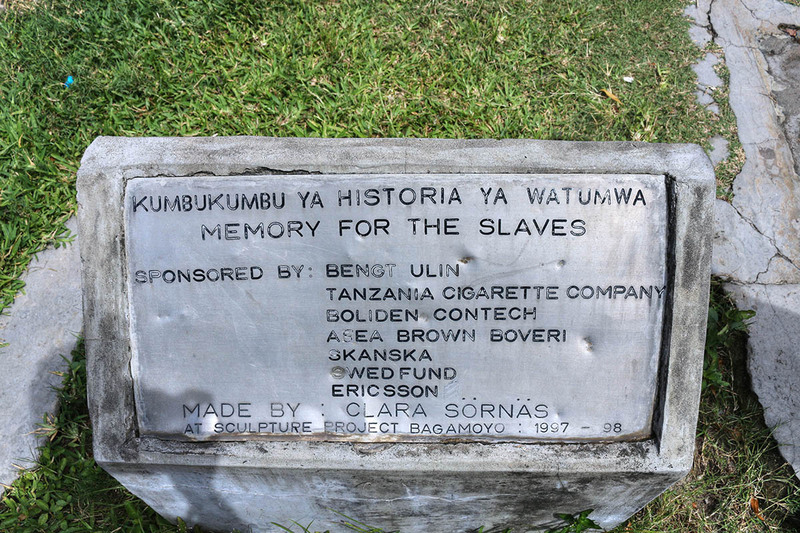 The caption around the grave is in Swahili and reads. 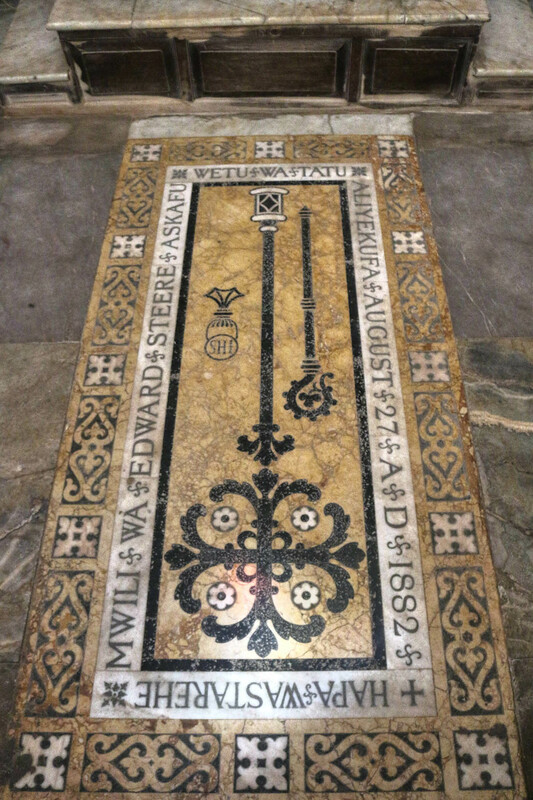 Here lies the body of Edward Steere our third bishop, who died in August 27 1882”. Once you leave the church you walk into the exhibition area. The ground floor of St Monica’s hostel houses the exhibition. 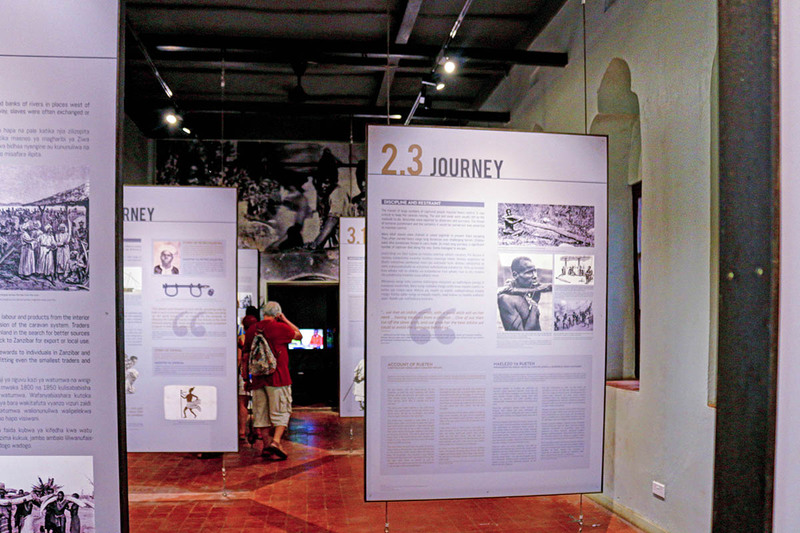 The exhibition gives a detailed history of slavery in Zanzibar. 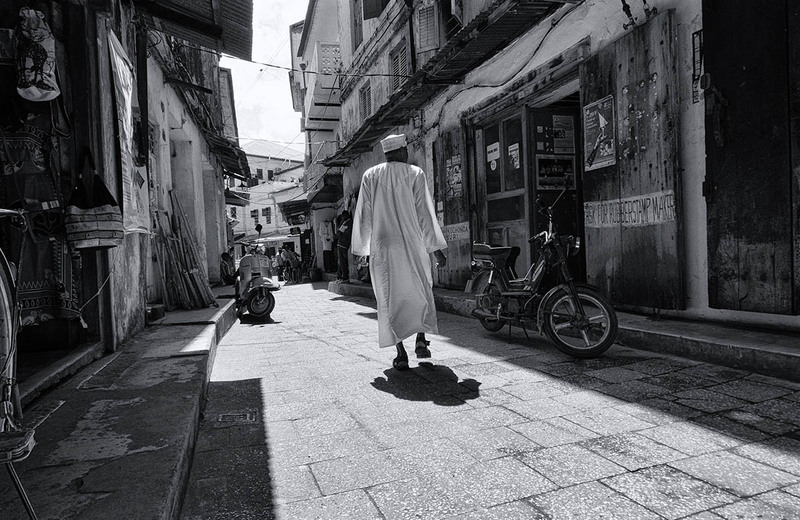 Mid-19th century Zanzibar’s streets were teeming slaves, some on transit to other destinations and others brought to work on the Island’s clove plantations. Slaves brought to Zanzibar came from an area that extended from the south of Lake Nyasa (now Lake Malawi), west of Lake Tanganyika and north of Lake Victoria. 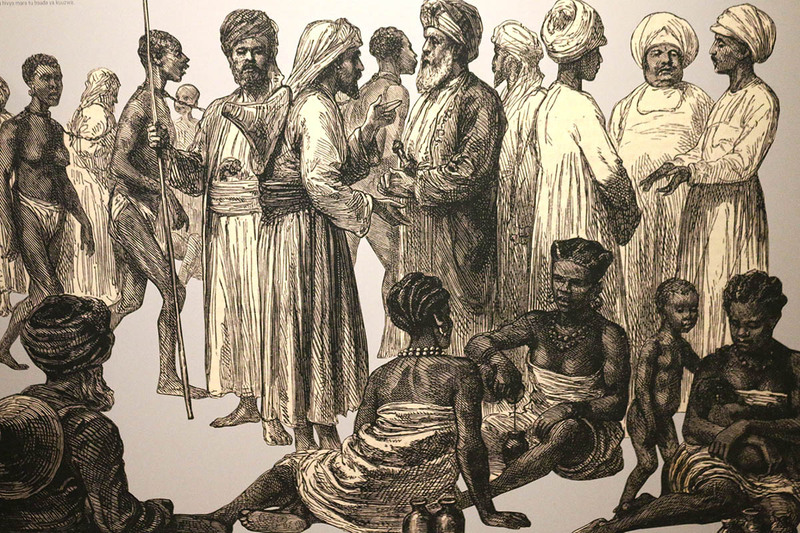 Not all slaves in Zanzibar came from Africa, women were brought in from other continents for the sultan’s harems. Caucasian and Mesopotamian slaves were among the most prized. Slaves came to predominate the population making about two thirds of the Island’s population. Slavery became so ingrained in society that the slaves who earned wages bought slaves or invested in slavery. The slave market would be opened around four in the afternoon. The people to be sold were set out in rows according to age or gender, suitability for employments or perceived value. Buyers made detailed inspections of eyes and teeth, whilst intrusive examinations were carried out on women. Accounts mention a stick being thrown for retrieval to determine fitness. 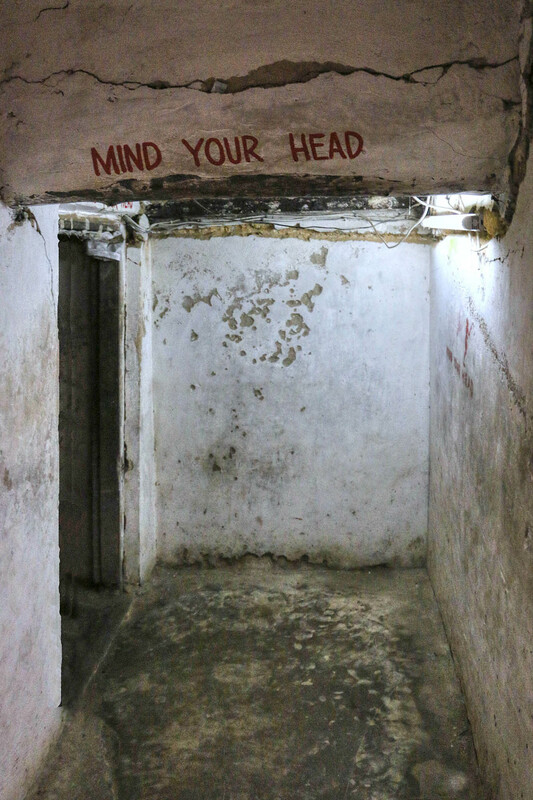 Underneath the hostel is the old slave chambers. 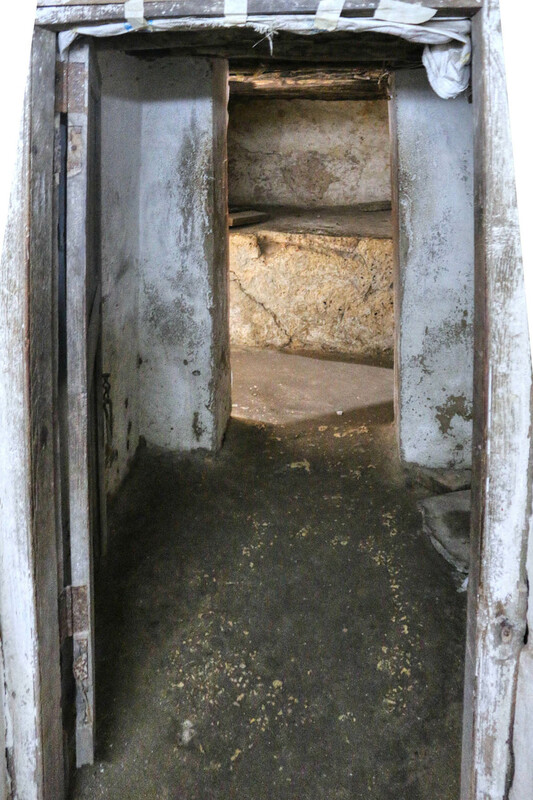 The two underground rooms were used to keep slaves before being taken to the market for auction. A small hut was built on top and there was a big hole used as an entrance to the slave chambers. There was only one small window at the end of the chamber and the others are a recent addition and did not exist when the market was in operation. 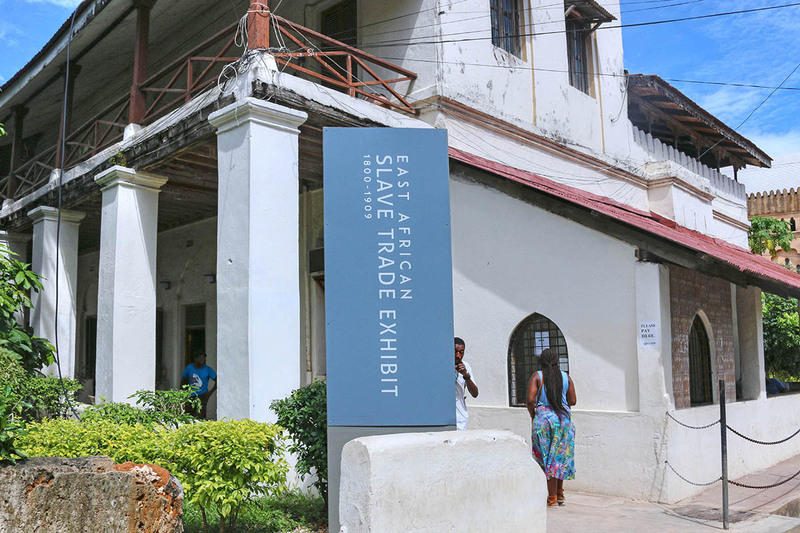 Slave trade as abolished in 1873 but slavery as an institution persisted in Zanzibar until 1909. Master slave relations and clandestine kidnappings continued at least 2 decades longer. 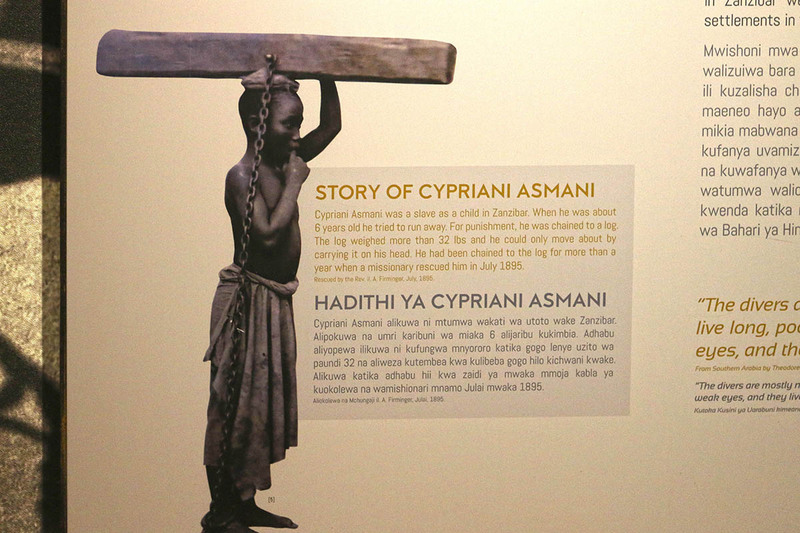 Cyrprin Asminani was a slave as a child in Zanzibar. When he was about 6 years old when he tried to run away. For punishment he was chained to a log. The log weighed more than 32 lbs. and he could only move about by carrying it on his head. 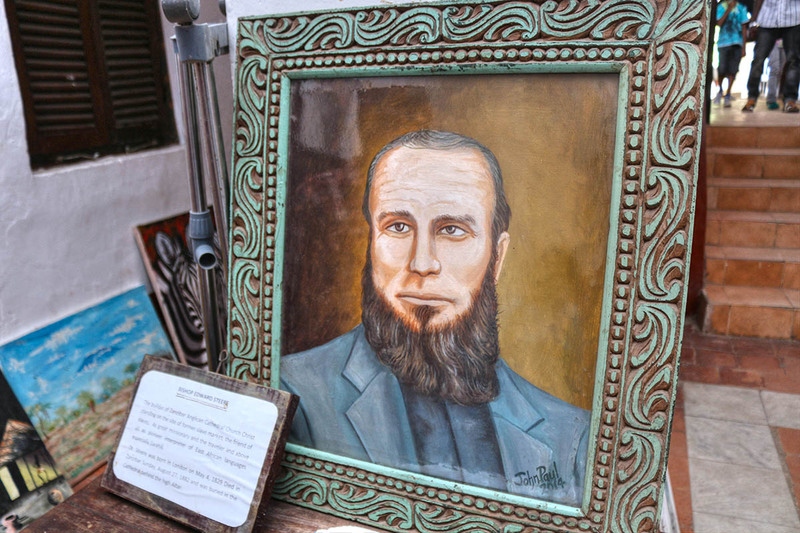 He had been chained to the log for more than year when a missionary rescued him in July 1895. 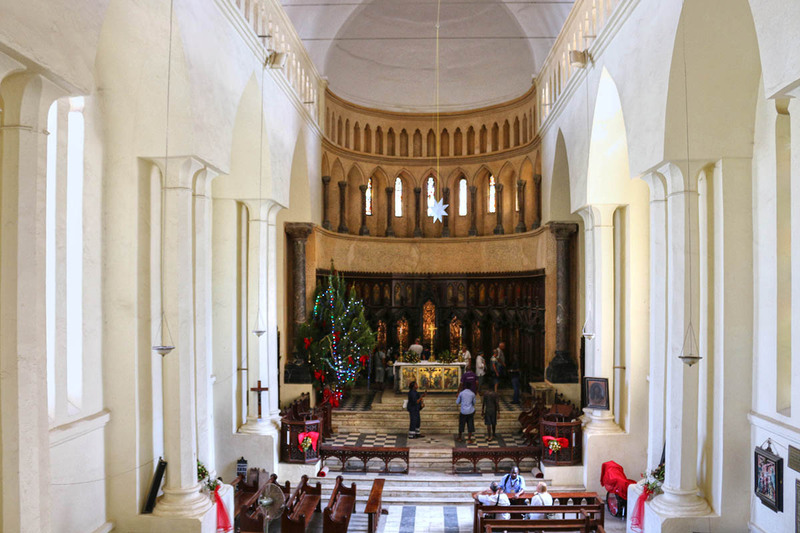 The Old Anglican Church is a must see for anyone interested in Zanzibar history. For an entrance fee of $5 you get a tour guide who will explain a detailed history of the site. A place where human beings, reduced to mere (and expendable) commodities, were brutalized without mercy. Though we will never fully comprehend what the slaves had to endure, the slave chambers does really give a sense of the horror that they must have experienced. *The marble columns are upside down! Edward Steere was away when they were installed only to come back and find that the workers had put them in the wrong way round. Since they did not affect the integrity of the building he decided that they be left as is. I had no idea that slavery existed into the 20th century. I like how the church was built over the slave trading area with key features linked to symbols of the trade. I am not sure i could visit a place with such a sad and terrible history. It is hard to understand how the institution of slavery every existed, but then I suppose there are terrible things in the world even today. stunning picture and a great article. thx for sharing. I went to Cape Town earlier this year and spend most of my time in the city learning about the slave market and the apartheid. It was very interesting. 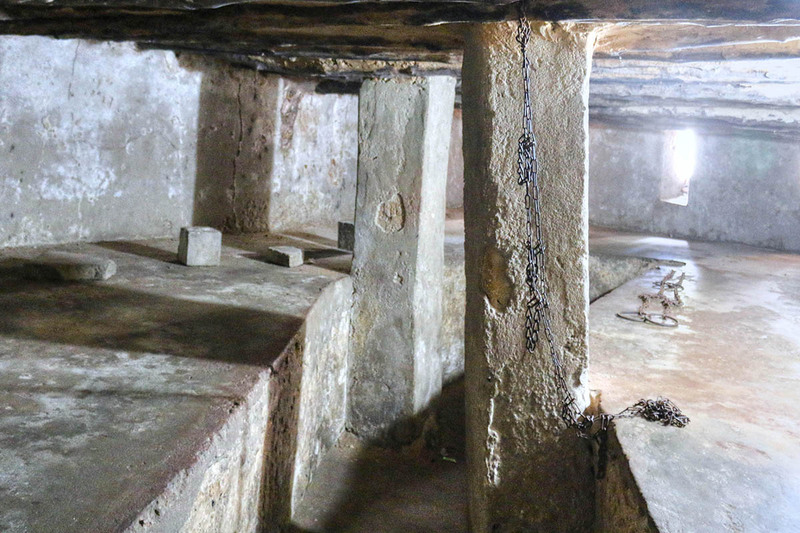 we visited a place outside of Dakar where slaves were kept until they were taken overseas. It was horrific and unsettling, but also very informativ. We deal with the fact that slavery existed in U.S. history but we don’t go into the details of what it entailed. I think it’s important to know these things even if it’s unpleasant. I must say that Zanzibar looks like a very interesting and colorful city! I would have never guessed that those columns were upside down, so thanks for giving us the answer. The beauty of that cathedral is a stark contrast to the slave market that stood on that site. That sculpture of the slaves in the pit is very compelling.